The iconic much loved 1992 Baz Luhrmann film has been adapted to the stage as a musical (in 2014)and is now joyously brought to life by the Willoughby Theatre Company in their latest production. Set in the mid 1980’s it follows Scott’s search to be true to his creative self and here is presented as a fairy tale. It’s the inspiring story of a championship ballroom dancer who defies all the Federation rules to follow his heart. Lovingly directed by Tom Sweeney all the favourite songs are retained (Perhaps , Perhaps , Time After Time, Love is In The Air etc ) and it is smoothly paced with a great cast and fine ensemble work. Choreography by Leanne Bampton and Natalie Neary is generally very faithful to the film, a witty blend of ballroom, ballet, Broadway and Flamenco (but here the Paso Doble was more Broadway than Flamenco really). As conceived by Tom Sweeney and Mike Brew the set design included the iconic Coca Cola sign and nifty use of projections for parts of Kendall’s studio, the Toledo milk bar and various clubs and motels. Some mobile pieces of the set can both function alone but also combine providing different perspectives. Sean Clark’s lighting was fluid and atmospheric. The costumes are boldly ,brightly coloured. The glitter! The spangles! The glamour! The ruffles and frills! The feathers! The beading! The incredible eye makeup and hair! The wigs! With his matinee idol good looks tall, handsome Matt Hourigan as Scott Hastings looks like an elegant ballet prince who handles the ‘triple threat’ easily, is a sensational dancer and brings to life the questioning young champion, but he is not really given the chance to show the deep heart of the rebellious dancer within. He seeks to be true to his inner passion and asks, for example, what does fellow competitor Wayne Burns (Alexander Caldwell) think of the steps? Should Scott stick to the Federation rules and win the Pan Pacific? Or, like his father Doug (Ian Johnson) does he take the path least followed and possibly face suspension and failure? Scott has a rather striking mirror dance sequence as well. Fran,‘just Fran’ is magnificently portrayed by Bernice Keen , transforming from hesitant , mousy clumsy and rather plain with glasses to alluring , vibrant proud and fiery in her Flamenco dress at the Pan Pacific. Scott’s mother, stressed Shirley Hastings , with her ‘Happy Face’ firmly in place , who is central to the plot,is given a strident , overblown yet endearing performance by Deirdre Lee . Doug Hastings , quiet , self effacing , often ignored, hiding behind the camera lens, and now often using an asthmatic puffer, was thoughtfully played by Ian Johnson .Like father like son – Doug wanted to dance his own steps too until his and Shirley’s world was shattered. Fearsome Barry Fife the lying , scheming head of the Federation is here depicted as a Donald Trump lookalike by Warren Blood. His sidekick Les Kendall, Doug’s friend and Shirley’s ex dance partner at one stage, who owns the studio that Shirley and Doug now work at, where Scott is a star, is portrayed by Andrew Benson as deliciously over the top camp Liberace in style with a wicked gleam in his eye. Janina Hamerlock as Abuela,Fran’s grandmother is intense ,proud , passionate and fiery in a fine, strong performance. At first she is scathing and wary of Scott’s involvement with Fran but grows to support them. (Fran’s father Rico is a far more minor character in this musical version than in the film). The production is delightfully presented in a cartoonish, pantomime sort of way which works quite well…. mostly. 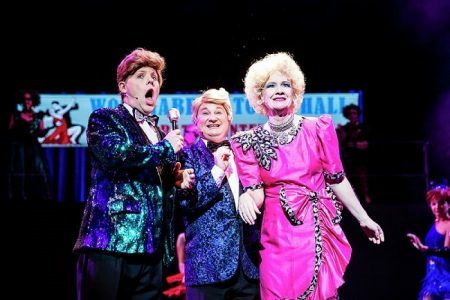 Highly kitsch and romanticised , it is full of superficial sparkle and glamour and the cast give their all with a sense of enthusiastic excess. The musical isn’t really given the chance to reveal deep character truths, not really letting us get too close and involved. The audience the night I attended however greatly enjoyed it and were singing along and clapping at the end to ‘Love Is In The Air’. Go on … life is a leap of faith. Running time – about 2 hours 40 minutes (approx.) including interval. STRICTLY BALLROOM from Willoughby Theatre Company [Facebook] is playing at the Concourse until the 3rd June 2018.